Providing AAHA accredited veterinary care and first-class customer service. From Bow-Wow to Meow, we have you covered. For the next few months, Aspen Ridge will be celebrating 10 years of dedicated service to the White Mountains. We will be giving away prizes and hosting several events during this time. We greatly appreciate our local community in helping us reach this milestone. You can learn more about our story here! 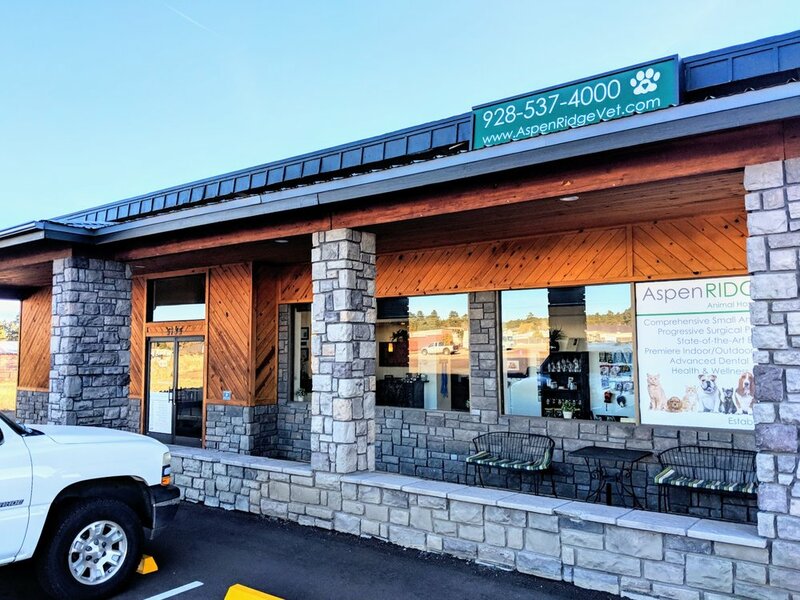 Aspen Ridge Animal Hospital provides veterinary care to the White Mountain communities of Show Low, Lakeside and Pinetop, Arizona. Our highly trained and nationally certified staff also provide emergency services for established clients. Aspen Ridge Animal Hospital is AAHA and Cat Friendly Accredited. *Cover Photo Provided By Great Dane Chronicles. Check out their wonderful new coffee table book! We value the relationship, continued trust, and goodwill we establish with our clients. Courtesy, respect, patience, education and understanding with clients and their pets are among our top priorities. • We treat our patients as if they were our own pets and offer clients the superior service that they desire and deserve. • We stress proactive medicine and progressive surgical procedures in an effort to maintain healthy, happy animals throughout their life. • We take a lifespan approach to each of our patients and are dedicated to being there from puppy/kitten vaccinations, through the illnesses and traumas, and eventually the geriatric years until the end of the pet’s life. • We are dedicated to client education and providing our clients with enough information to make appropriate decisions for their animal companions. 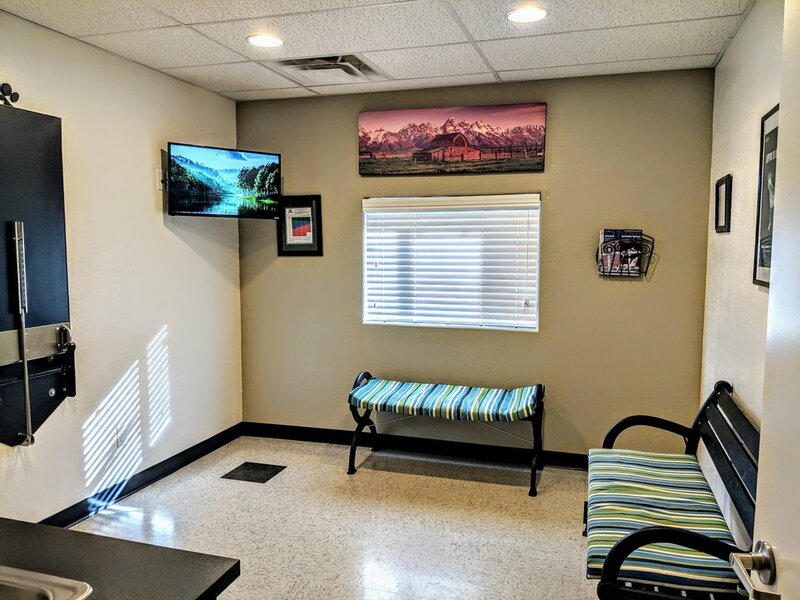 • We offer a cat-only reception area and cat-only exam room for our feline patients - YES, we are CAT FRIENDLY ACCREDITED by the American Academy of Feline Practitioners. 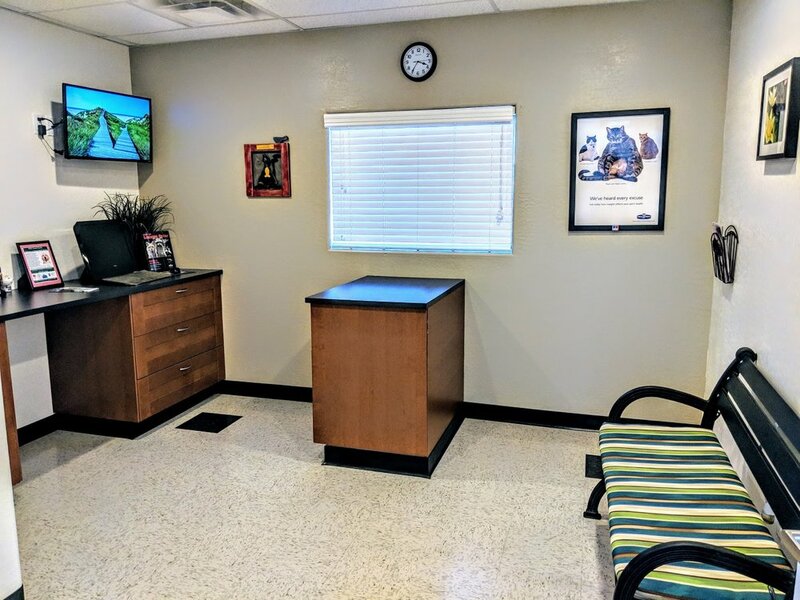 Schedule a tour of Aspen Ridge and find out why we are one of the best primary veterinary care facilities in Arizona. At Aspen Ridge we understand the critical part good dental care plays in the overall health of your pet. With 50% of the tooth below the gum line, our team uses an advanced Digital Dental X-Ray system to "look" at the physical condition of the mouth. 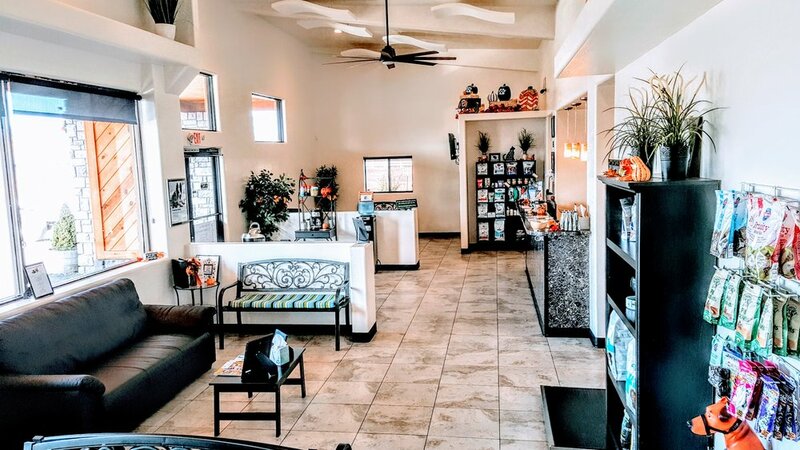 With an estimated 80 percent of pets with significant oral pathology, Aspen Ridge is prepared, certified and continually trained (by Arizona Veterinary Dental Specialists) to care for your pets dental needs. Our in-house lab affords us the opportunity to provide better patient care and diagnostics. Results can be completed in about 15 minutes, there is no delay in initiation of treatment and adjustments to treatment can be made more quickly. Samples collected are representative of the patient at that moment, not days or weeks ago, as when samples have to be sent out. This allows our clients to have the peace of mind knowing the current health of their pet. Every year there are advances in techniques, procedures and pain management for animals. Aspen Ridge uses High Frequency (HF) radio-surgery. While traditional electro-surgery and laser devices cut using the electrode tip to concentrate heat in the tissue, a HF radio unit serves as the resistance, hence there is no heating. We also use state-of-the-art patient monitoring to provide better observation of key vital signs during surgery, post-op and critical care. Unlike human hospitals, not all animal hospitals are required to be accredited by the American Animal Hospital Association (AAHA). What does accreditation mean? It means our hospital holds itself to a higher standard, and that your pet is receiving care at a hospital that has passed the highest standards in veterinary care. At Aspen Ridge, our goal it to provide your pet with a safe and comfortable home away from home. To honor that commitment, we require your pet to be fully vaccinated and an established patient with our hospital. In order for us to verify your pet has all the required vaccinations and is parasite free, please bring in or have your previous veterinarian fax us your pet’s latest vaccination records at your initial exam with one of our veterinarians. Your dog or cat needs to be at least 16 weeks (4 months) old to board with us as this is the typical age in which they receive their last round of puppy/kitten immunizations and are considered fully vaccinated. Additional services available include bath and brush, extra play time, additional walks, pedicures. We can also offer your dog a frozen peanut butter Kong or a Frosty-Paws “Pupcicle”. Call for a customized quote for your pet’s stay with us. We will verify vaccination records and parasite prevention are up to date. You will complete a boarding questionnaire so that we can accommodate your pet’s schedule and preferences. We will need a deposit and contact information in case of emergencies. The check out process starts with bringing your pet’s belongings to you and finalizing any payment after reviewing an itemized invoice of services provided. This gives the resort staff time to prep your pet for the ride home - whether that is walking your dog for a bathroom break or loading your cat in its carrier. We do this first so you can fully focus on greeting your pet who will of course be excited to see you. Although we have no cancellation policy for most days of the year, we do require a non-refundable deposit for reservations during peak times (Thanksgiving, Christmas). For other times of the year we appreciate advance notice if your plans change and you need to adjust or cancel your pet’s stay. 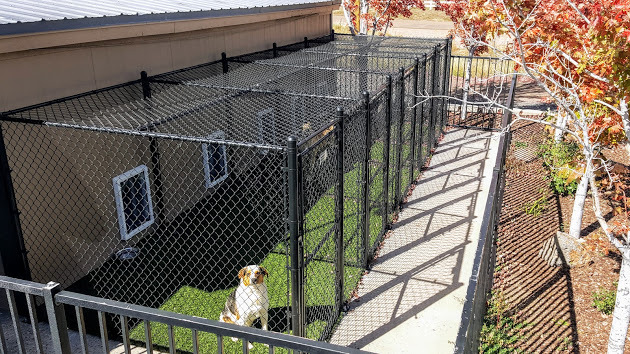 Resort options for dogs include Indoor-Outdoor runs are 4 x 5 inside, with a 5 x 8 foot artificial grass yards and private dog doors ($40 daily). Indoor-outdoor runs include oral medication administration at no additional charge. We also offer Private Indoor runs (4 x 5) in a climate controlled room with piped in music ($30 daily). 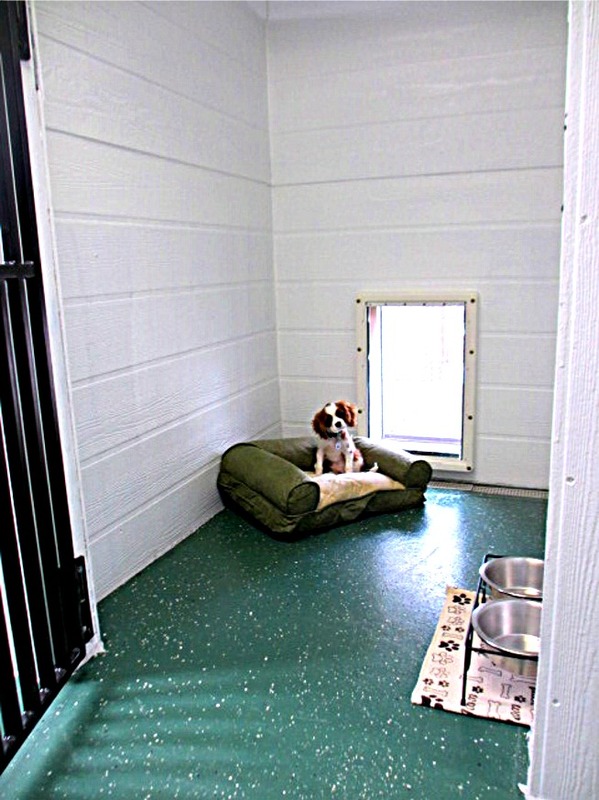 Regardless of which room you choose for your dog, your pet will have walks 3 times daily (twice daily outside during regular business hours) and access to our fenced exercise yard for play time. All dogs will need proof of the following from a veterinarian. 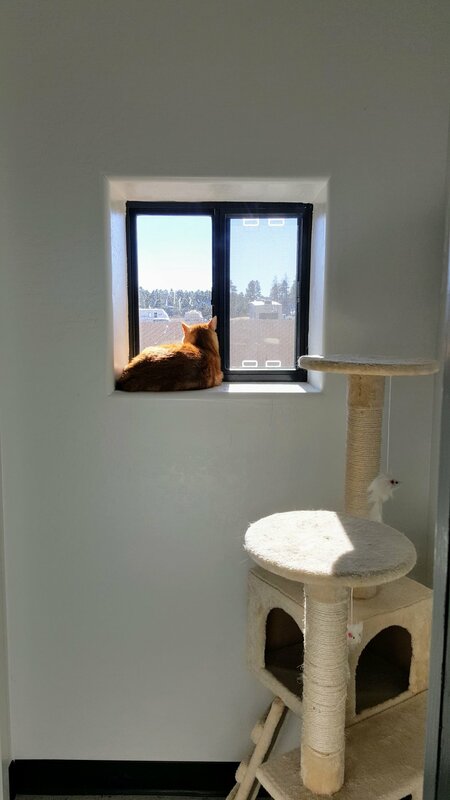 Resort for cats includes double decker condos with private “cubbies” and utilization of the kitty play room ($20 daily). All cats will need proof of the following from a veterinarian. To minimize any disruption of your pet’s stomach, please bring your pet’s usual food. Food from home can be packaged in its original bag, a different container, or measured into individual zip-lock bags for each meal. Please be sure you can accurately convey how much food your pet eats at each meal. Does your pet have a favorite treat? You’re more than welcome to bring them in the original packaging or counted out into a zip-lock bag. (If applicable) Are medications or supplements part of your pet’s daily routine? We ask that you bring all medication and supplements in their original containers as well as instructions concerning when and how your pet is accustomed to receiving them. It’s important to us that we’re aware of all your pet’s health concerns and that he continues his regiment without interruption. Does your cat have a carrier that he’s used to being transported in? If not, get your cat accustomed to one prior to his stay as this is the safest way to transport him into the hospital resort. Does your pet have a favorite bed or blanket at home? We want your pet as comfortable as possible and often times that includes something that smells like home. Please label any bedding you bring so we can ensure it goes home with you. Does your pet enjoy playing with a toy during their down time? You are welcome to bring your pet’s toys from home, but please limit the toys to 3 per guest. We always try our best, but we cannot be responsible for the safe return of toys, so please, leave any valuable or one-of-a-kind toys at home.